Advanced Level projects (usually require knowledge of both silk embroidery and bead embroidery. Japanese Embroidery classes are taught at Blue Bonnet Studio in Houston and other locations. Please check out EVENTS for a complete list of dates and times of the Japanese Silk & Bead Embroidery Study Group. Kit prices and frame requirements are available under the BEAD KIT PRICES menu item. 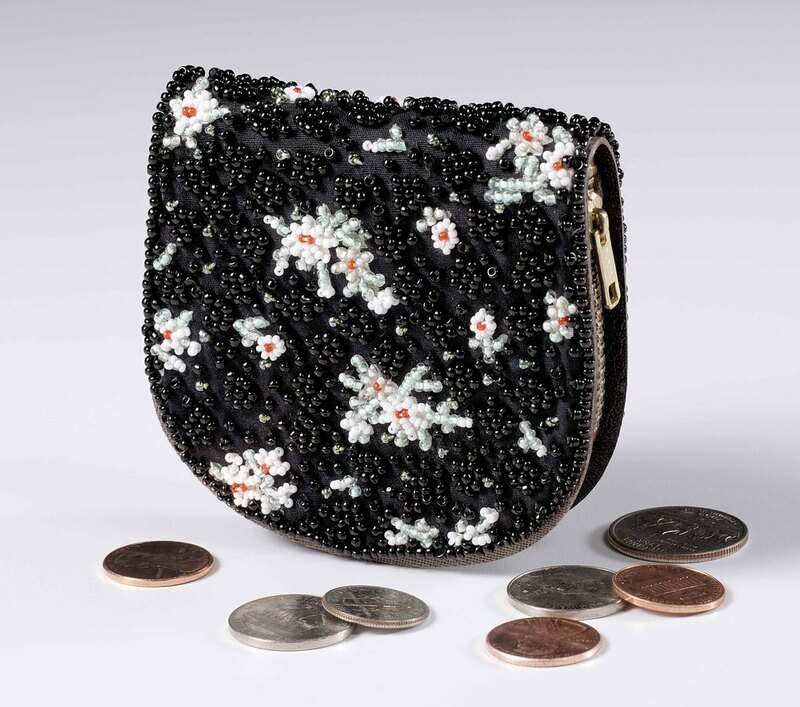 The Coin Purse is done in the Japanese bead embroidery method and is a beginner level piece. Bead Embroidery in the Japanese method incorporates silk embroidery techniques translated with beads rather than silk threads. The beads used are a wide variety Tri-cut and glass seed beads. The Eye Glass Case is done in the Japanese bead embroidery method and is a beginner level piece. Bead Embroidery in the Japanese method incorporates silk embroidery techniques translated with beads rather than silk threads. The beads used are a wide variety Tri-cut and glass seed beads. The foundation fabric is a floral 100% cotton fabric by Peter Pan Fabric and is out of print, thus the kits are no longer available. Please see the Prickly Paisley Eyeglass case as the new alternative. Both the Prickly Paisleys satin small oval jewelry box (right) and the eyeglass case are done in the Japanese bead embroidery method and are beginner level pieces. Bead Embroidery in the Japanese method incorporates silk embroidery techniques translated with beads rather than silk threads. The beads used are a wide variety Tri-cut and glass seed beads. The foundation fabric is a paisley and vine design 100% cotton fabric called Sunflower Province by Moda Fabric. The Kimono Neck pouch is done in the Japanese bead embroidery method and is a beginner level piece. Bead Embroidery in the Japanese method incorporates silk embroidery techniques translated with beads rather than silk threads. The beads used are a wide variety Tri-cut and glass seed beads. The foundation fabric is a floral 100% cotton fabric by Avlyn Creations. The Hana Kimi Cover is done in the Japanese bead embroidery method and is a beginner level piece. Hana Kimi means blooming flowers in Japanese. Bead Embroidery in the Japanese method incorporates silk embroidery techniques translated with beads rather than silk threads. The beads used are a wide variety Tri-cut and glass seed beads. The foundation fabric is a floral 100% cotton fabric by Avlyn Creations. Rosy Posy Brooch is done in Japanese bead embroidery method and is an entry-level piece offered in a pink, blue or yellow palette. Bead Embroidery in the Japanese method incorporates silk embroidery techniques translated with beads. The beads used are a wide variety Tri-cut, bugle beads and glass seed beads. The foundation fabric is a Floral 100% cotton fabric called Wild Child Trellis Tryst by designer Jane Sassaman stitched using Evertite™ stretcher bars. Fusible Muslin and Mattress pad fabric are used as the backing materials. Wire is added along the stems sandwiched in-between the backing fabrics so the leaves become bendable. Finishing may be done commercially or by the individual. The Golden Waves of Grains Evening Clutch is done in Japanese bead embroidery method and is an entry-level piece. Bead Embroidery in the Japanese method incorporates silk embroidery techniques translated with beads. The chic Swaroski Rhinestone Zipper compliments the Black Tri-cuts and glass seed beads. The Sachiko pattern of Pampas Grass is recreated in 24 kt Gold Plated Beads. The foundation fabric is Black 100% silk Bridal Satin stitched using stretcher bars. A fashionable black Dupioni Silk lining partners beautifully to the clutch design. The Sweetheart Minaudiere is done in Japanese bead embroidery method and is an entry-level piece. Bead Embroidery in the Japanese method incorporates silk embroidery techniques translated with beads. The center Initial is created using padding underneath the beads and custom ordered to the student’s desire. The Minaudiere kit is an original design by Ellen Medlock Studio of Tulsa, OK and can be finished easily by the individual stitcher. The beads used are a wide variety Tri-cut and glass seed beads. The foundation fabric is a floral 100% silk Bridal Satin in White or Coral stitched using stretcher bars. 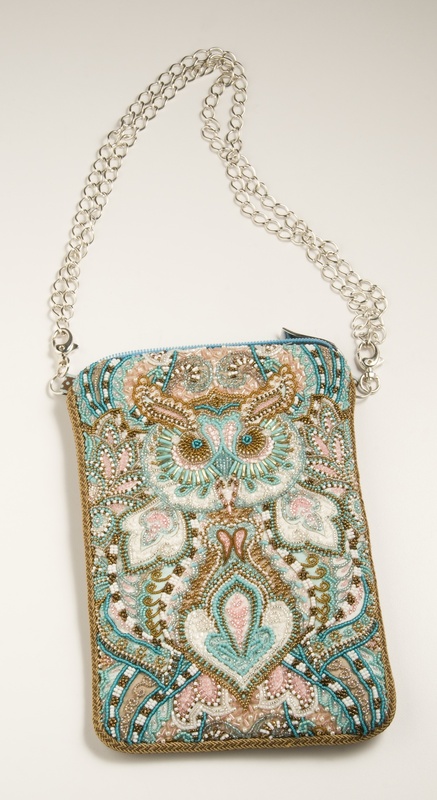 What-A-Hoot Carrying Case is done in Japanese bead embroidery method and is an beginning-level piece offered in a green or blue palette. Two different pattern widths are offered for either an iPad or Kindle. Bead Embroidery in the Japanese method incorporates silk embroidery techniques translated with beads. The beads used are a wide variety Tri-cut, bugle beads and glass seed beads. The foundation fabric is a Paisley Owl 100% cotton fabric called Hushabye by designer Tula Pink (see samples below) stitched using Evertite stretcher bars. The lining fabric is a waterproof fabric called Babyvil, adding extra protection for the electronic items it is designed to hold. The backing fabric is made from a suede-cloth and trimmed with a golden waffle braid and constructed with a zipper closure. Pink Handle set available for a additional amount. Finishing may be done commercially or by the individual. Prince Charming Satin Box is done in Japanese bead embroidery method and is an entry-level piece. Bead Embroidery in the Japanese method incorporates silk embroidery techniques translated with beads. The Satin Boxes have a pop-out lid making the finishing process as easy as 1, 2 and 3. The beads used are a wide variety Tri-cut and glass seed beads with a dash of 24 kt Gold beads. The foundation fabric is a paisley 100% cotton fabric called Prince Charming by Tula Pink, which comes in three color ways: GREEN, BLUE & RED. The piece is stitched using Evertite stretcher bars. Janet, a long time student of Mary Alice's, chose to finish this project as a purse rather than for the top a box. This example is provided to show that the piece can be used other ways. Converting to a purse is not part of this class. Bead Embroidery on Cotton Calico Fabric in orange & topaz tones or peach & topaz tones. 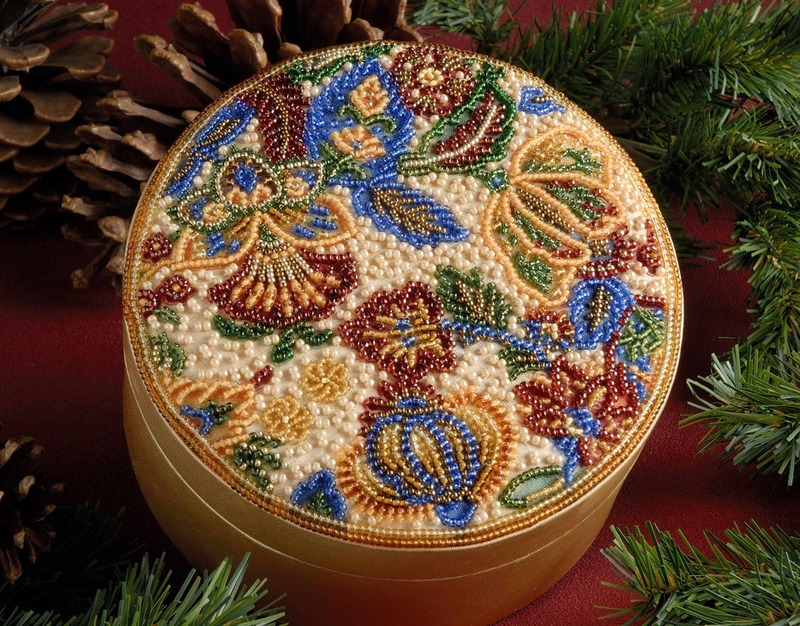 The Floral Fantasy satin round jewelry box is done in the Japanese bead embroidery method and is a advance-beginner level piece. Bead Embroidery in the Japanese method incorporates silk embroidery techniques translated with beads rather than silk threads. The beads used are a wide variety Tri-cut and glass seed beads. The foundation fabric is a Jacobean floral 100% cotton fabric called Woodblocks by Hoffman Fabric. The Paisley on Parade satin oval jewelry box is done in the Japanese bead embroidery method and is an advance-beginner level piece. Bead Embroidery in the Japanese method incorporates silk embroidery techniques translated with beads rather than silk threads. The beads used are a wide variety of Tri-cut and glass seed beads. The foundation fabric is a paisley 100% cotton fabric called Chocolat by Moda. Folio Clutch is an advance-beginner project. 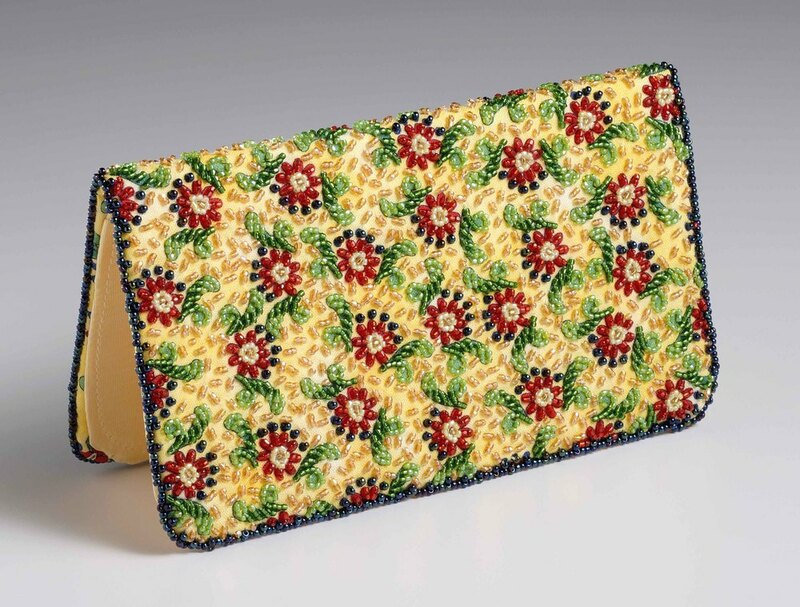 Ms. Reiko Matsukawa, author of “Bead Embroidery Bag Textbook” created the Folio Clutch design (© JEC) to teach the couching technique. The beads used are Tri-cut Beads that are black and gunmetal in color. Tri-cuts beads reflect light and add zing and give it’s appealing texture. The foundation fabric is black Shusu silk. The lining fabric is black Bridal Satin. The piece requires being stitched on a traditional Japanese Embroidery frame. Chic Purse is an intermediate project. 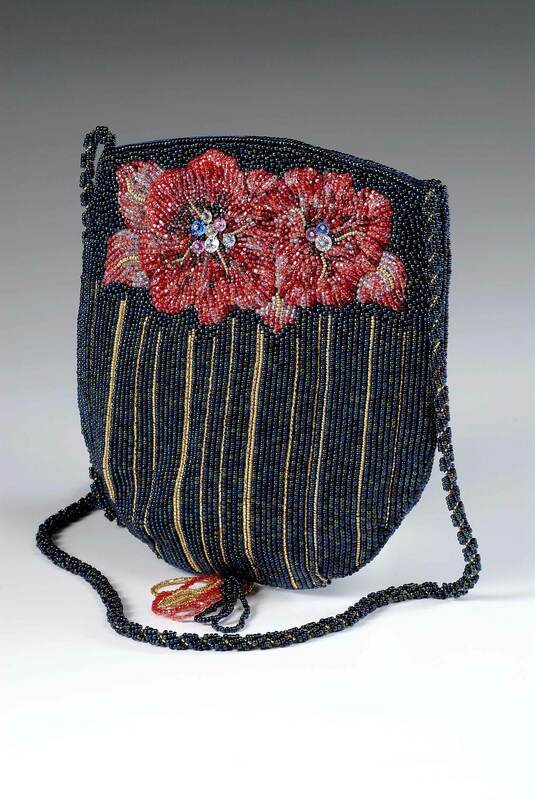 Ms. Reiko Matsukawa, author of “Bead Embroidery Bag Textbook” created the Chic Purse design (© JEC) using raised and couching techniques. Using different bead cuts along with sizes created fascinating shading. The beads used are Tri-cut beads and glass seed beads either in a gold/silver color scheme or black and gunmetal color scheme. The foundation fabric is white Nishijin silk or black Shusu silk. The piece is stitched on a traditional Japanese Embroidery frame. Poppy Pouch is an intermediate project. Ms. Reiko Matsukawa, author of “Bead Embroidery Bag Textbook” created the Poppy Pouch design (© JEC) to teach the raised technique. The beads used are various Tri-cut beads and glass seed beads either in a black & gold with rose flowers or white & gold with blue flowers. The foundation fabric is black Shusu silk or white Nishijin silk. The piece is stitched on a traditional Japanese Embroidery frame. Ms. Matsukawa is author of “Bead Embroidery Bag Textbook” created the Peacock Purse design (2003© JEC) using a variety of techniques. The beads used are a wide palette of Tri-cut beads and glass seed beads. An intricate lace or a simple fringe changes the overall appearance of the handbag. The foundation fabric is black Nishijin silk. The piece is stitched on a traditional Japanese Embroidery frame. The finishing can be done by the individual or in Japan. A mini coin purse or a decorative tablemat is also available in this design. Japanese Bead Embroidery - Intermediate Level - Exotic Elegance Satin Pillow designed by Ms. Reiko Matsukawa. Ms. Reiko Matsukawa, author of “Bead Embroidery Bag Textbook”, created the Exotic Elegance Satin Pillow design (2012© JEC) applying raised techniques to emphasize the four symmetrical arabesque motifs. The beads span from light Foundation fabric is creamy silk satin. The piece is stitched on a traditional Japanese Embroidery frame. Japanese Bead Embroidery - Intermediate Level - Checker Board Handbag designed by Ms. Reiko Matsukawa. Ms. Reiko Matsukawa, author of “Bead Embroidery Bag Textbook”, created the Checker Board Handbag design (2007© JEC) using simple lines of held thread. Repeating three bead colors and alternating line lengths against the black foundation gives the handbag its striking pattern. The beads used are a wide palette of Tri-cut beads and glass seed beads. The foundation fabric is black velvet silk. The piece is stitched on a traditional Japanese Embroidery frame. The finishing is done in Japan. Ms. Reiko Matsukawa, author of “Bead Embroidery Bag Textbook”, created the Floral Melody Handbag design (2005© JEC) using a variety of techniques. The beads used are a wide palette of Tri-cut beads and glass seed beads. The foundation fabric is cream Bridal Satin 100% silk. The piece is stitched on a traditional Japanese Embroidery frame. The finishing is done in Japan. The finishing cost includes the metal purse frame. 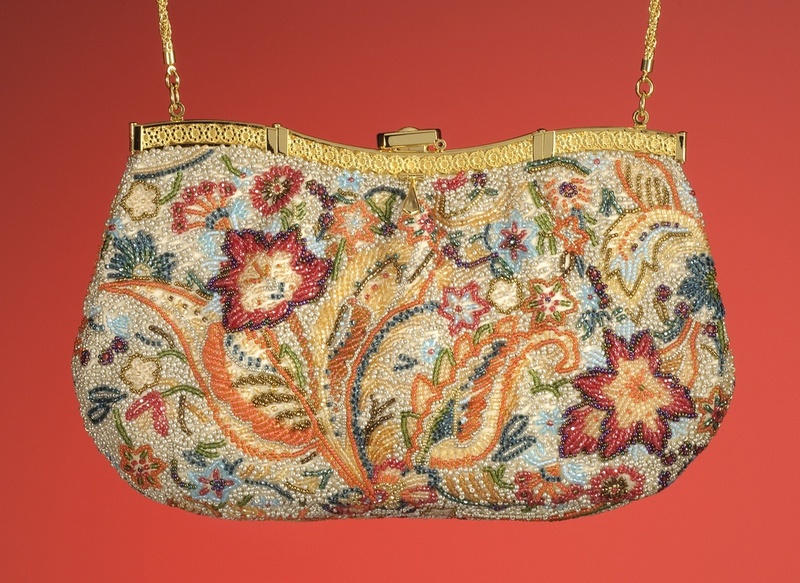 Camellia Handbag is an advance project that requires knowledge of silk embroidery. Ms. Reiko Matsukawa, author of “Bead Embroidery Bag Textbook” created the Camellia Purse (© JEC) utilizing both Japanese embroidery and beadwork combined. The beads used are teal colored Tri-cut Beads with gold & black seed beads. The foundation fabric is white Nishijin silk. The piece is stitched on a traditional Japanese Embroidery frame. The finishing is done in Japan. Pochette is an advanced project. Ms. Reiko Matsukawa, author of “Bead Embroidery Bag Textbook” created the Pochette design (© JEC) using a variety of techniques. The beads used are a wide variety Tri-cut beads and glass seed beads coordinated to the foundation fabric. The foundation fabric is a floral or paisley design 100% cotton fabric. The piece is stitched on a traditional Japanese Embroidery frame. 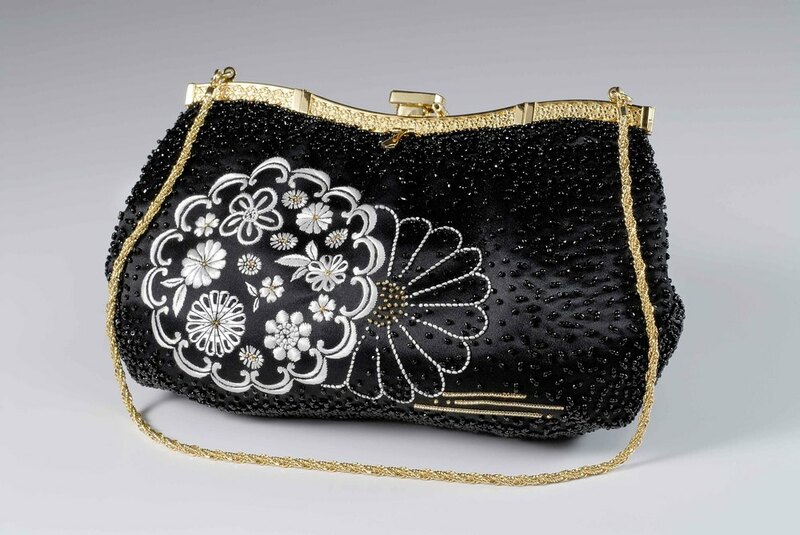 White Blossom Handbag is an advance project that requires extensive knowledge of silk embroidery. Ms. Reiko Matsukawa, author of “Bead Embroidery Bag Textbook” created the White Blossom Handbag (© JEC) utilizing both Japanese embroidery and beadwork combined. The embroidery motif models antique lace design. The beads used are black Tri-cut beads and glass seed beads. The foundation fabric is black Shusu silk. The piece is stitched on a traditional Japanese Embroidery frame. The finishing is done in Japan. 2nd Place winner in surface embroidery at the South Central EGA Regional Seminar 2007. Arabesque Purse is an advance project that requires knowledge of silk embroidery. Ms. Reiko Matsukawa, author of “Bead Embroidery Bag Textbook”, created the Arabesque Purse (2001© JEC) utilizing both Japanese embroidery and beadwork combined. The beads used are variety of bronze colored seed beads. The foundation fabric is dyed brown Habatae silk. The piece is stitched on a traditional Japanese Embroidery frame. The finishing can be done by the individual or in Japan.